Epiphrenic diverticula are an uncommon form of esophageal diverticula that occur in the distal esophagus and are associated with esophageal motility disorders. These pseudodiverticuli develop due to localized esophageal muscle weakness and high intraluminal pressure seen in esophageal disorders that cause outflow obstruction. Patients with epiphrenic diverticula can experience dysphagia, regurgitation, and chest pain. The diagnosis is typically made after a barium esophagram, which also allows for localization and measurement of the diverticulum. Patients with severe or intractable symptoms are indicated for surgery. There are multiple surgical approaches to treating epiphrenic diverticula. 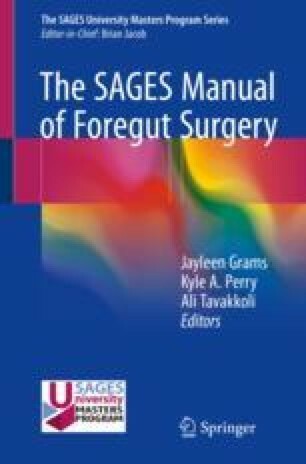 However, for the scope of this chapter, the focus will be on the most common approach which is laparoscopic transhiatal diverticulectomy and Heller myotomy with partial fundoplication. This minimally invasive approach allows patients to avoid the associated pain, increased hospital length of stay, and increased morbidity seen with other surgical approaches.